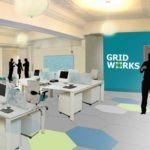 Gridworks Durham (powered by American Underground) is opening in early April 2017! Available space for small teams and freelancers. Located in the heart of the Bull City, Gridworks Durham gives professionals a place to collaborate, work, and contribute to the city’s electric pulse. Durham is where creatives dazzle crowds, restaurants delight taste buds, and entrepreneurs build bridges to the future. Are you ready to connect your business to a thriving community of thinkers and doers? Whether you’re a freelancer or marketing professional, artist or lawyer, bring your expertise. We’ll provide the top-notch workspace. Durham will do the rest.